Transactions are sequences of actions such that all of the operations within the transaction succeed (on all recipients) and their effects are permanantly visible, or none of none of the operations suceed anywhere and they have no visible effects; this might be because of failure (unintentional) or an abort (intentional). 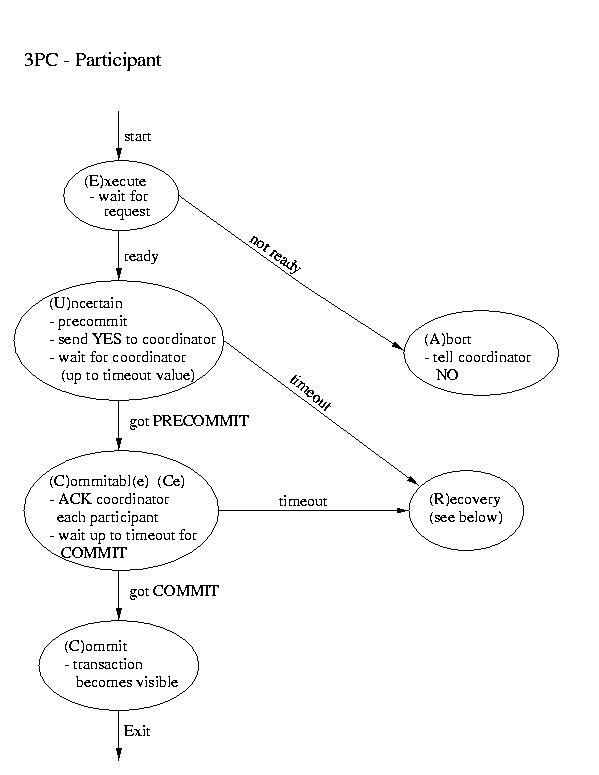 Characterisitically, transactions have a commit point. This is the point of no return. Before this point, we can undo a transaction. After this point, all changes are permanant. If problems occur after the commit point, we can take compensating or corrective action, but we can't wave a magic wand and undo it. Notice that if a failure occurs after points 1 & 3 the customer loses money. If a failure occurs after points 2, 4, or 5, no money is lost, but the collectiopn of operations cannot be repeated and the result in not correct. Point 7 is the commit point. Noticve that if a failure occurs after point 7 (the ATM machine jams), only corrective action can be taken. The problems can't be fixed by undoing the transaction. Acid - "All or nothing"
Consistency -- Perhaps better described as "Serializability". Transactions begin with the system in a valid state and should leave things that way once completed. Isolation - Regardless of the level of concurrency, transactions must yields the same results as if they were executed one at a time (but any one of perhaps several orderings). Durability - permanance. Changes persist over crashes, &c.
Often times a transaction will be distributed across several systems. This might be the case if several replicas of a database must remain uniform. To achieve this we need some way of ensuring that the distributed transaction will be valid on all of the systems or none of them. To achieve this, we will need an atomic commit protocol. Or a set of rules, that if followed, will esnure that the transaction commits everywhere or aborts everwhere. The most commonly used atomic commit protocol is two-phase commit. You may notice that is is very similar to the protocol that we used for total order multicast. 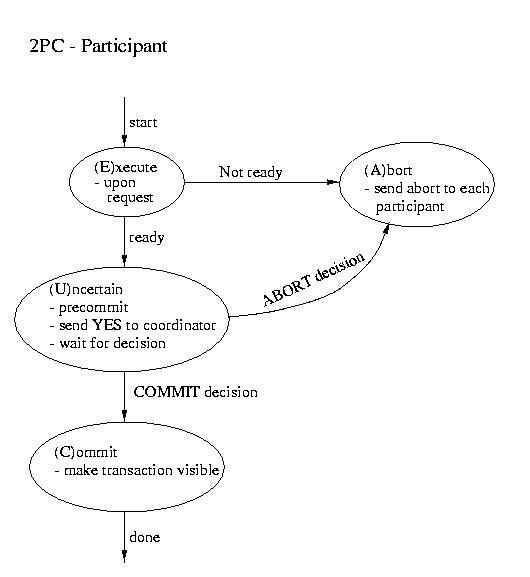 Whereas the multicast protocol used a two-phase approach to allow the coordinator to select a commit time based on information from the participants, two-phase commit lets the coordinator select whether or not a transaction will be committed or aborted based on information from the participants. Another real-world atomic commit protocol is three-pahse commit (3PC). This protocol can reduce the amount of blocking and provide for more flexible recovery in the event of failure. Although it is a better choice in unusually failure-prone enviornments, its complexity makes 2PC the more popular choice. If the participant finds itself in the (R)ecovery state, it assumes that the coordinator did not respond, because it failed. Although this isn't a good thing, it may not prove to be fatal. If a majority of the participants are in the uncertain and/or commitable states, it may be possible to elect a new coordinator and continue. If any participant has aborted, it sends ABORTs to all (This action is mandatory -- remember "all or none"). If any participant has committed, it sends COMMIT to all. (This action is mandatory -- remember "all or none"). 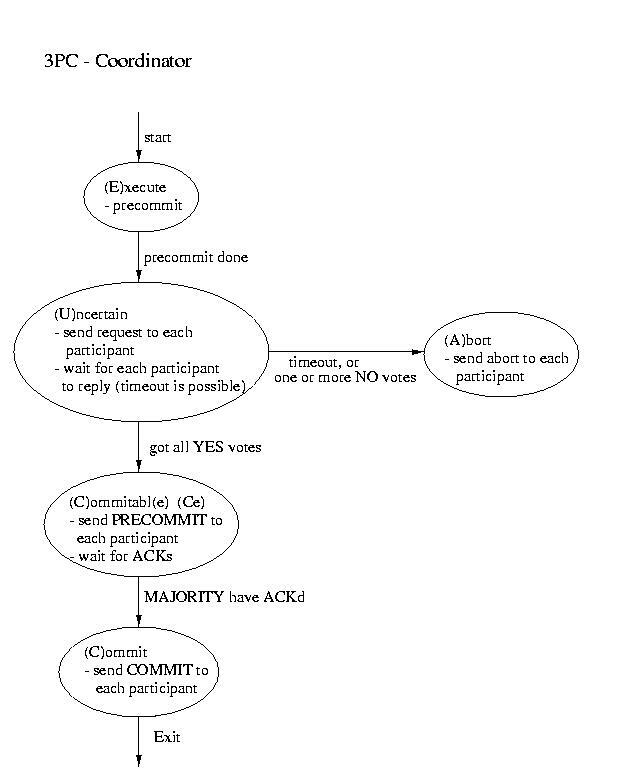 If at least one participant is in the commitable state and a majority of the participants are commitable or uncertain, send PRECOMMIT to each participant and proceed with "the standard plan" to commit. If there are no committable participants, but more than half are uncertain, send a PREABORT to all participants. Then follow this up with a full-fledged ABORT when more than half of the processes are in the abortable state. PRECOMMIT and abortable are not shown above, but they are complimentary to COMMIT and commitable. This action is necessary, because an abort is the only safe action -- some process may have aborted. If none of the above are true, block until more responses are available. Transaction, by their nature, play with many different, independent resources. It is easy to imagine that, in our quest for a high throughput, we process two transactions in parallel that share resources. This can generate an obvious problem for "Isolation". We need to ensure that the results are consistent with the two (or more) concurrent transactions being commited in some order. So we can't allow them to make uncoordinated use of the resources. So, let's asusme that, while any transaction is writing to a resource, it is locked, preventing any other transaction from writing to it. Now, a transaction can acquire all of the locks it needs, complete the mutation, and release the locks. This scheme prevents the corruption of the resources -- but opens us up to another problem: deadlock. Fortunately, circular-wait is often very easy to attack. If the resources are enumerated in a consistent way across users, e.g. A, B, C, D, ...Z, and each user requests resources only in increasing order (without wrap-around), circular wait is not possible. One can't wait on a lower resource than one already holds, so the depednency chain can't be circular. This observation is the basis of a two-phase lock. In the first phase, a transaction acquires -all- of the locks it needs in strictly -increasing- order. It then uses the resources. In the last phase, it shrinks, or releases locks. This universal ordering in which all users acquire resources prevents deadlock. In practice, transactions often are said to begin phase-1 (growing) when they start and end phase-1 when they are done processing and are ready to commit. Phase-2 begins (and ends) upon the commit. So, the essential part of 2PL is, as you might guess, the serial order in which the locks are acquired. The two phases are, in practice, mostly imaginary. Transactions must execute as if in isolation. That doesn't necessarily prohibit concurrency among transactions -- it just implies that this concurrency shouldn't have any effect on the results or the state of the system. In fact, as long as the results and other state are the same as for some serial execution of the transactions, the transactions can be interleaved, executed concurrently, or btoh. Transaction processing systems (TPSs) contain a transaction scheduler that dispatches the transactions and allows them to execute. This scheduler isn't necessarily FIFO, and it doesn't necessarily dispatch only one at a time. Instead, it tries to maximize the amount of work that gets done. One popular measure of the performance of a TPS is the number of transactions per second (TPS). Yes, unfortuantely, TPS is also its abbreviation. In discussing the scheduler, it is helpful to ask the question, "What is a schedule?" It is an ordering of events. The transaction scheduler's job is to execute the indivdual operations that compose the transactions in an order that is efficient and preserves the property of isolation. As a result, it is the schedule of individual operations that is our concern. A serial schedule is a schedule that executes all of the operations from one transaction, before moving on to the operations of another transaction. In other words the transactions are executed in series. An interleaved schedule is a schedule in which the operations of an individual transaction are executed in order with respect to the same transaction, but without the restriction that the transactions be scheduled as a whole. In other words, interleaving allows the scheduling of any operation, as long as the operations of the same transaction are not reversed. Some interleaved schedules are safe, whereas other way result in violations of the isolation property. Safe interleaved schedules are known as serializable schedules. This is because an interleaved schedule is only safe if it is equivalent to a serial schedule -- that's why they call it serial-izable. What did I mean when I wrote, is equivalent? An interleaved schedule is equivalent to a serial schedule, if transactions which containing conflicting operations are not interleaved. Operations are said to be conflicting if the results differ depending on their order. This means that an interleaved schedule is serializable if, and only if, each pair of operations occurs in the same order as they would in some serial schedule. 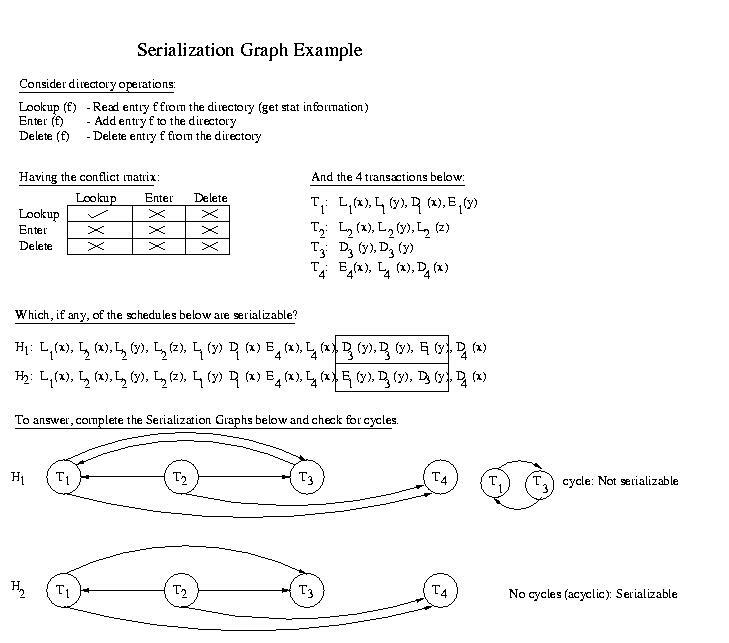 We can see if a schedule is serializable by building a serialzability graph. The Fundamental Theorem of Serializability states that a schedule H is serializable, if and only if, SG(H) is acyclic. So how do we build a serializability graph? Draw an edge from Ti to Tj if and only if some operation in Ti conflicts with an operation in Tj and the operation in Ti occurs before the operation in Tj in the given schedule. The example belwo will make this a bit clearer.
. . . L1(x) . . . L1(y) . . . D3(y) . . . D3(y) . . . E1(y) . . . If we look at the fragment, we see that L1(x) conflicts with D3(y). Since L1(x) occurs before D3(y) in H1, an equivalent serial schedule must execute T1 before T3. But if we look further ahead in the trace we see that D3(y) occurs before E1(y). Similarly, since these operations conflict, it implies that T3 must occur before T1 in an equivalent serial schedule. Both of these statments cannot be true. If T1 executes before T3, T3 cannot execute before T1. This schedule cannot be converted to an equivalent serial schedule. It is not serializable -- it is not safe. Remember two-phase locking from last class? Although it is handled by the transaction manager, it does allow for the interleaving of operations. Are the schedules that it generates serializable? The answer to this is yes. Two-phase locking ensures that transactions which use the same objects cannot execute concurrently. This ensures that no conflicts can happen. If interleaved transactions don't share, we know that we are safe. Two phase locking ensured serialzable schedules using what is known as inconsistency prevention. Prevention techniques constrain the transactions to ensure that conflicting operations can never happen. Two-phase locking does this by preventing transactions that share objects from executing concurrently. Although inconsistency prevention is effective, it is also expensive. Perfectly safe sharing may be prevented -- this unnecessarily reduces concurrency.